This is a 21 and older event. For those of you that still wish to enjoy good music or aren't old enough to go to the main event - we have an afterparty. We strongly encourage you to buy tickets in advance to help us plan the tournament. Independent donations also accepted at Dream Catcher. We would appreciate your early arrival to ensure a timely start to the tournament. This is Dusty Cohee, the 14-year-old son of Dusty and Earleen Cohee, of Hallsville, MO. He had a heart transplant in the summer of 2003. He is currently undergoing dialysis because his kidneys are not functioning. He cannot have a kidney transplant until he recovers from his earlier surgery. He is on anti-rejection medication and has to see the doctor every day. Dusty's condition is deteriorating. His family is struggling, emotionally and financially. We want to help the Cohee family. 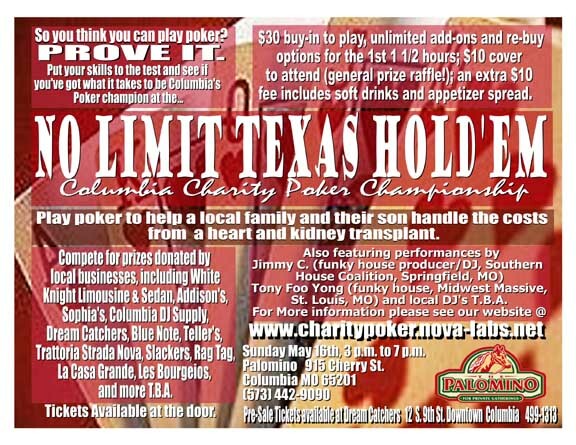 We are coordinating a charity poker tournament, all proceeds from which will go directly to Dusty and his family. The tournament is open to individuals aged 21 and up. Sunday, May 16th, 3 p.m. to 7 p.m.
Diana and Brian Ash, owners of the Palomino, have graciously agreed to host the tournament. This location is ideal logistically because it is a venue designed for private events. Furthermore, it features two rooms, one of which is already furnished with tables and chairs for use in the competition. The Palomino will have a cash bar available for individuals aged 21 and up, and for an additional $10 fee an appetizer spread and fountain drinks are available. Poker (particularly No Limit Texas Hold ‘em) has exploded in the public consciousness. The last year has seen a breakout into the mainstream, however the trend has been growing steadily for ten years. Poker tournaments of the type we are hosting are now the number-one rated shows on the Travel Channel. ESPN’s coverage of the World Series of Poker is the most consistently watched program on that network. Bravo’s second highest rated show is Celebrity Poker Challenge. Fox Sports channel has recently started airing No Limit Hold ‘em tournaments from Great Britain. Finally, NBC (parent) of Bravo will start broadcasting its own Poker tournaments in prime time starting in June. Unlike baseball or football, fans of Poker can play the exact same game (usually with less skill) as the professionals on television. There are no barriers to entry like equipment and playing fields for the average person who becomes interested in playing Poker—and a lot of people have become interested. Poker played by people of ages is now a $4 billion a year industry. From a fund raising perspective Poker is a uniquely suited vehicle. Players are used to providing cash for the opportunity to play. Other events like Golf tournaments must add value beyond the activity itself (i.e., celebrity participants) in order to garner a wide audience. A Poker tournament requires only a place to play, other players and a prize pool reflective of the entry size. 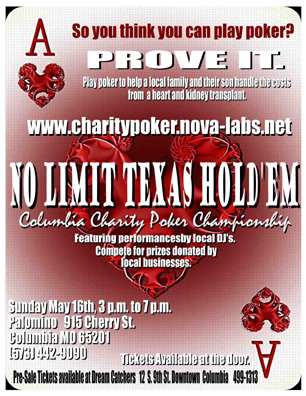 Additionally, charity Poker tournaments are already a fund raising fixture in cities like Chicago and St. Louis. Despite public interest in Mid-Missouri, the closest legitimate venue for Poker is 100 miles away (Isle of Capri Casino in Booneville does not provide Poker). By capitalizing on this upsurge in interest, appealing to the human instinct to support a good cause, and organizing an event which promises competition as well as entertainment, we believe we can put together a hugely successful tournament that will generate substantial proceeds for this deserving family. This event is being sponsored by the Hallsville Community Development Association, a charitable organization dedicated to community service. Participants will be charged a $30 buy-in, and have the option of unlimited add-ons for the first hour and a half as well as a re-buy at the end of the first hour and a half. Because this is a charity event, the players are not competing for cash prizes. Local businesses have been kind enough to donate gift certificates, goods and services to create a prize pool to reward the top competitors. Prizes have been donated by White Knight Limousine & Sedan, Addison’s, Sophia’s, Columbia DJ Supply, the BlueNote, Dream Catcher, Teller’s, Trattoria Strada Nova, Le Bourgeios Winery, La Casa Grande, Slackers, RagTag and more. Further, the tournament is an entertainment event as well. The event will feature live music by Springfield techhouse producer/dj Jimmy C, St. Louis house dj Tony Foo Yong, and several local djs t.b.a. As previously mentioned, we will also have a cash bar available. In addition, we will hold a general prize raffle: all competitors and attendees will receive one raffle ticket with their entry fee, and have the option of purchasing additional tickets for $2 each. Individuals who don’t wish to actually compete in the tournament can come to socialize, have fun, and support their friends, all in the name of a truly worthy cause. We will charge non-competing individuals a $10 cover charge, proceeds from which will also go to the Cohee family. Thank you for your interest. Please help Dusty Cohee and his family.